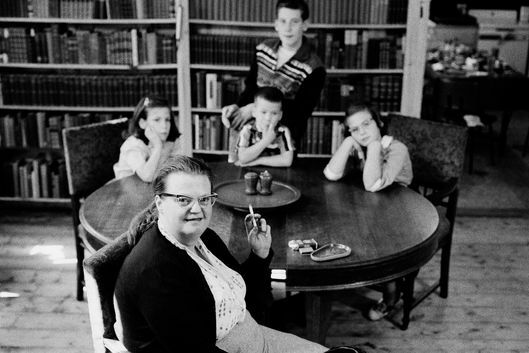 cut cover story September 27, 2016 8:00 a.m.
Shirley Jackson wrote 17 books while raising four children &mdash; and she couldn't have had a successful career without them. In June 1948, Shirley Jackson’s story “The Lottery” — a dark fable about a ritual stoning conducted in an apparently ordinary village — roiled the readers of The New Yorker, generating more mail than the magazine had ever before received in response to a work of fiction. A few months later, Jackson arrived at the hospital to deliver her third child. The clerk asked for her occupation. “Writer,” she replied. “I’ll just put down housewife,” came the response. Reading this now, we cringe. Between 1941, when her first story appeared in The New Republic, and her premature death of heart failure in 1965 at age 48, Jackson published six novels and dozens of stories that count as some of the most original, indelible fiction of her time. In addition to “The Lottery,” one of the most anthologized stories in American fiction, she has been most celebrated for The Haunting of Hill House (1959) and We Have Always Lived in the Castle (1962), masterpieces in the American Gothic tradition of Hawthorne and Poe. During her lifetime, she was equally well known for her best-selling memoirs about her boisterous family, which included four children, a menagerie of pets, and — not incidentally — her husband, literary critic and Bennington faculty member Stanley Edgar Hyman. The idea that she was ever “just a housewife” sounds crudely reductionist. Yet the clerk’s assessment was not entirely inaccurate. In addition to being a talented, determined, ambitious writer in an era when it was still unusual for a woman to have both a family and a profession, Jackson was a mother who tried to keep up the appearance of running a conventional American household (at least for the sake of the material it generated) while making space for her own creative life amid her bustling family. The tension between the two roles — both internal and external, based simultaneously in her expectations for herself and in the expectations of her husband, family, publishers, and readers — animates all her writing. A drawing she made during the early years of her career brings it into relief. A muscular woman, looking disgruntled, drags her husband off by his hair as another couple look on worriedly. “I understand she’s trying to have both a marriage and a career,” one says to the other. Marriage came in August 1940, shortly after Jackson and Hyman graduated from Syracuse University. Career progressed more slowly. Like so many would-be writers of their day, the couple set up house in Greenwich Village, but both initially stagnated in menial jobs. After an ill-fated return to Syracuse bookended by two abortive sojourns in a rustic cabin in rural New Hampshire, they came back to the city shortly before Laurence, their first child, was born in October 1942. Hyman had been offered a staff job at The New Yorker, but Jackson continued to suffer through what would prove to be one of the longest dry spells of her professional life. After publishing her first story in December 1941, a comic piece based on her experience selling books at Macy’s, she had not been able to write much else. While Hyman turned out book reviews and brief items for The New Yorker’s “Comment” page, she drew cartoons depicting scenes from her life and shopped around a few stories unsuccessfully. In the literary circles Jackson and Hyman moved in, having a family was considered unusual. Visibly pregnant at a Partisan Review party in 1948, Diana Trilling, the wife of Lionel Trilling, was approached by the wife of another writer who asked her incredulously if her husband was letting her have the baby. Midge Decter — who, with her husband Norman Podhoretz, the future editor of Commentary, was friendly with Jackson and Hyman in the 1950s — remembers that “it was the men who needed looking after … They had many demands.” One of Jackson’s cartoons demonstrates Hyman’s obliviousness to the needs of his pregnant wife: She struggles in the door, her arms laden with groceries, as a seated Hyman says from behind the New York Times, “Dear, you know the doctor said you weren’t to carry anything heavy.” Another, captioned “six o’clock feeding,” depicts Hyman sitting next to baby Laurence, dressed in an identical shirt and in an identical posture, as Jackson approaches with a tray holding a wine bottle and a baby bottle. Having children was “not part of the bohemian life,” as Decter says. But it was a life for which Jackson was instantly, innately suited. If she and Hyman discussed their plans for their family in advance, they left no record of such a conversation in their letters or journals. To no one’s surprise, Hyman’s attitude toward the children was hands-off — he preferred to sequester himself with his typewriter behind a closed door. “Bring ’em to me when they can read and write,” he liked to say. Jackson once commented that at age 2, Laurence’s definition of “Daddy” was “man who sits in chair reading.” In this, Hyman was hardly unusual for a man of his time — it was simply assumed that mothers would take full responsibility for caring for their children. Dr. Spock’s famous baby-care manual may have revolutionized American attitudes toward child-rearing upon its publication in 1946, but its famous opening lines — “Trust yourself. You know more than you think you do” — were addressed to mothers alone. Jackson couldn’t help repeating some of the strictures with which her own mother, a San Francisco socialite, raised her, scolding her daughters for climbing trees and making them wear garters and high heels as teenagers. By and large, however, she embodied Spock’s intuitive, casual approach. She was determined to give all four of her children an upbringing that was down-to-earth, creative, and loving — different in every way from the rigid household in which she spent her childhood. When Laurence had trouble sleeping as a baby, Jackson played boogie-woogie records to console him. She sang the children all kinds of songs, from the Child Ballads her English father loved to a gruesome ditty called “The Grattan Murders” that would eventually appear in The Haunting of Hill House. She was indulgent enough to send them to bed at night with a piece of candy or a glass of orange soda, and she could be permissive — or absentminded — to the point of laxness. At least two of her children tell of being brought back home by a neighbor after wandering into the village on their own. As he grew older, Laurence was allowed to roam more or less wherever he wanted, but the younger children had to stay within a certain distance of the house. Jackson would sit on a stool in the kitchen, looking out the window, to make sure they were still where they were supposed to be. “She was afraid she would lose us,” Sarah, her third child, remembers. Jackson could be a tough disciplinarian — one of Sarah’s friends would later recall, with lingering terror, a slumber party at which the writer sternly quieted a room of giggling girls. But she also had a sense of humor about the children’s misdeeds. One day Laurence, 12 or 13 years old, balked when she told him to take a bath. Jackson went into the kitchen, came back with an egg in her hand, and smashed it on his head. “Now you need a bath,” she said. 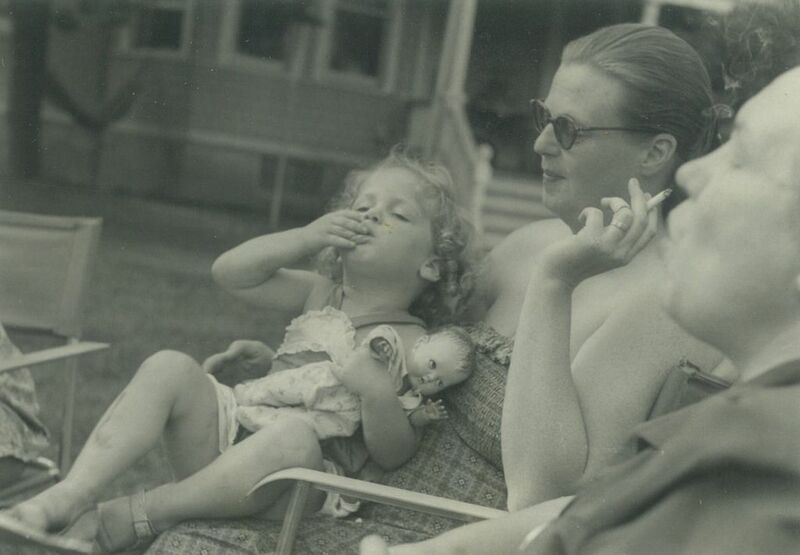 She also cherished the small rituals that serve as the motor of a family. Every night, even if one of the legendary Hyman parties was in progress, Jackson came upstairs at bedtime and went from room to room to bid each child good night. Jackson had always had an imaginative, even magical mind, filled with witchcraft lore, myths, and fantasies of her own devising. Hyman, ever a rationalist, had limited patience with that aspect of her character, tolerating no suggestion of religion and scolding her for believing in ghosts. In response, she turned to her children, who became happy participants in her fantasy life. After Sarah had a series of dreams about an imaginary country, Jackson encouraged her to draw maps of it and make up languages spoken there, as she herself had once done with her own fantasyland. When 8-year-old Laurence asked his mother how he ought to spend a dime, she suggested he give it to the birch tree in front of their house. He promptly went outside and asked the tree for a dime’s worth of wind. To Jackson’s delight, a massive hurricane struck that night. “All we could figure was that wind must be very cheap indeed for him to get that much for a dime,” she wrote to her parents. In turn, the children nurtured their mother’s imagination. Fascinated by the evolution of a child’s consciousness, Jackson delighted in their developing minds. She would write in an unpublished essay of her astonishment at overhearing Laurence and Joanne talking about the colors in a sunset, or Sarah sitting down at the piano and announcing that she was going to compose a piece that would sound exactly like the cats running down the stairs. Such episodes provided Jackson with a deep well of material that she would draw on many times for the comic essays that she published in women’s magazines throughout the late 1940s and 1950s and collected in her memoirs. But her empathic capacity to see her children as they truly were also was important to her fiction. Her career began to gain traction only after she became a mother. 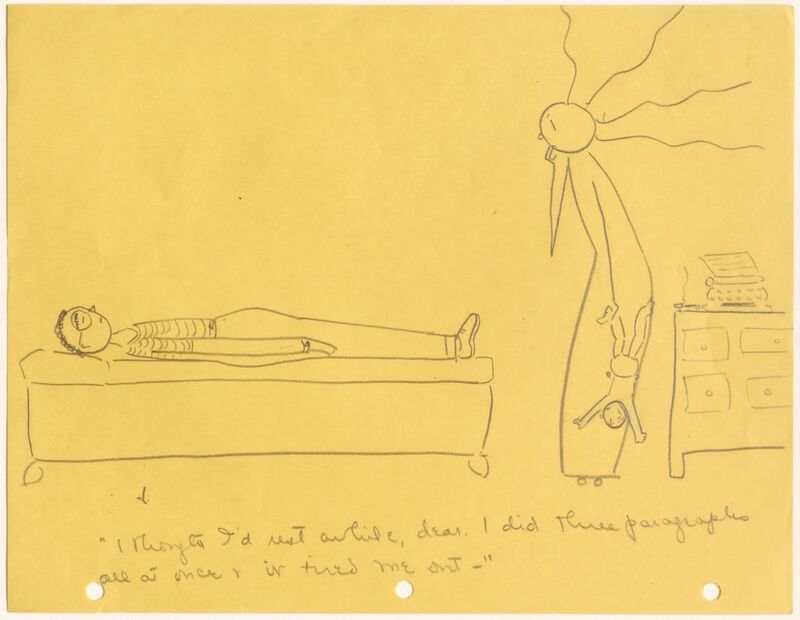 Writing to a friend in early 1943, Jackson covered the pages of her letter with pictures of Laurence but confessed that she did “very little writing these days.” The accompanying drawing shows the baby sitting on top of her head. 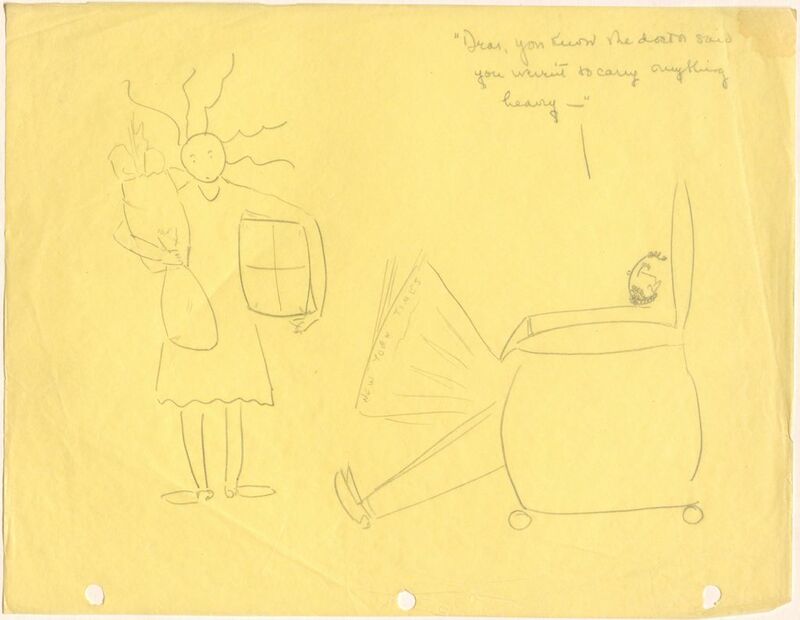 Her cartoons, as well, depict her frustration with her limited writing time — and her resentment of Hyman’s comparative freedom. In one, Jackson, holding the baby by his ankle, discovers her husband taking a nap: “I did three paragraphs all at once and it tired me out,” he says. The typewriter sits conspicuously in the background. While Jackson had less time to write, Laurence’s arrival seems to have unlocked her creatively. Within a few months of his birth — a period when many mothers (and fathers) are still woozy with sleep deprivation — two of her stories were accepted by The New Yorker, marking her first appearance in that prestigious publication. It can be no accident that both of them center on a child. “After You, My Dear Alphonse,” published in early 1943, pokes fun at a white mother’s efforts to hide her discomfort when her young son brings home a new friend who is black. The story manages the trick of viewing the mother’s racism from the perspective of the black child — for which Jackson’s friend Ralph Ellison complimented her — while remaining relatively lighthearted. In “Afternoon in Linen,” a savage snapshot of the gleeful cruelty of which children are capable, a girl named Harriet humiliates her grandmother in retaliation for being forced to read her poetry aloud. In both stories, Jackson presents the world of the child not through the gauzy veil of the usual women’s-magazine fare, but unvarnished. Children are no innocents, Jackson’s work tells us; they are easily the equals of adults in connivance and brutality. In “The Lottery,” they are the first to gather in the village square, where the boys select “the smoothest and roundest stones”; even little Davy Hutchinson must join with the other villagers in stoning his own mother. Writing in the hours between morning kindergarten and lunch, while a baby napped, or after the children had gone to bed demanded a discipline that came to suit Jackson. She was constantly thinking of stories while cooking, cleaning, or doing just about anything else. “All the time that I am making beds and doing dishes and driving to town for dancing shoes, I am telling myself stories,” she said in one of her lectures. Many of her stories were already virtually finished by the time she managed to sit down at the typewriter. Her friend Kit Foster told of playing Monopoly one evening with Jackson and Hyman when Jackson abruptly withdrew from the game and went into her study, where she banged audibly at her typewriter. Less than an hour later, she emerged with a story that was sent off to her agent the next morning. The idea for “The Lottery” came to her while she was grocery shopping with her daughter Joanne, then age 2. After they came home, she put away the groceries, put the child in her playpen, and wrote the story. Any doubts about exactly how difficult it was to do what Jackson did — producing classic works of fiction while managing what we now call “work-life balance” with virtually no support from her husband or anyone else — should be put to rest by the fan mail she received constantly from admiring readers, many of them mothers who were aspiring writers in search of advice. Over and over, the letter writers wonder at Jackson’s ability to do her writing while also caring for four children — a phenomenon that also mystified some of her friends. She occasionally wrote back to her readers, suggesting practical strategies such as planning out a piece before sitting down at the typewriter and, not surprisingly, ignoring housework to carve out more writing time. In private, she confessed her impatience with such comments. “This is a remark I have never been able to answer,” she mused after a weekend guest wondered aloud how she could be so productive. She did it, of course, because there was no other way. She needed the children as much as they needed her. Their imaginations energized her; their routines stabilized her. More important, their heedless savagery was crucial to her worldview. Jackson could not come into her own as a writer before she had children. She would not have been the writer she became without them. Adapted from Shirley Jackson: A Rather Haunted Life by Ruth Franklin. Copyright © 2016 by Ruth Franklin. Published by Liveright Publishing Corporation. All rights reserved.